Welcome to the Windsor Photo Outfitters Website! 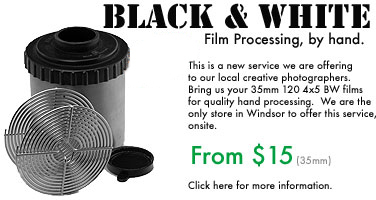 Windsor Photo Outfitters has been servicing Windsor and Essex county since 1994. 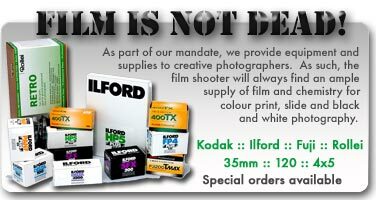 As always, we offer excellent quality new and used film cameras, the latest in Digital Photography, and the largest Darkroom selection you are apt to find. All of this in a friendly low pressure environment with knowledgeable experienced staff. The Staff at Windsor Photo Outfitters is dedicated to the art and craft of fine photography no matter what level you are shooting at. We cater to "weekend shooters", Working professionals, and the art photographer alike. Let our experience work for you. We are entirely locally owned and operated, so you know you will get a level of service unavailable at the chain stores, or the "big guys". 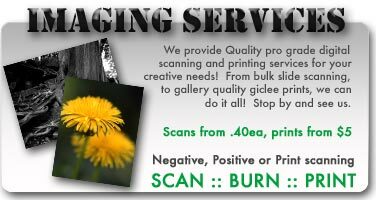 We are the ONLY camera store in this region with a full-time experienced service technician. After exploring our website, why not stop by and see us, we have a hot pot of coffee waiting for you. NOTICE: Have you tried to call us recently?